"An old legend says a mountain cannot house more than one dragon. So it says." Beyond the far end of the Old Mountain, where the sun's first rays caressed the ground each morning and the air smelled of sea salt, smoke began to rise. Merely a thin line slithering up into the sky at first, it grew and spread, sapping the colours of the world and leaving it grey and dry. The earth shook, as a deafening roar travelled through the network of cracks in the ground. The Hydra was waking up, the world would soon be engulfed in Fire and Ice would strike its very core - The Heart of Everything. The only way to stop this would be to summon a sorceress more powerful than even the horrid monster - the Queen of the Dragons. But where was she? Wait, don't you mean "the Mother of Dragons"? Nope, I don't wanna mix fandoms. Shame, it sounds cooler that way. Will you let me finish the story? I don't want to be an elf. When her dwarven lover arrived, the duo set off In the Middle of the Night for they had no time to lose, yet they did not know where to look for the Queen of the Dragons. Even worse, everything worked upside down in the depths of the dwarven mines, so our blacksmith was terribly disorientated. 'What Have You Done? We're going the wrong way!' he would complain occasionally, and the witch would reluctantly correct him and give him a kiss on the forehead. They sought guidance in the kingdom of Delain, where they met with the Lady Charlotte, known for her kindness and radiance. And so they were on their way again, the dwarf now complaining that he did not want to adjust to everything being on the "wrong" side. When the Lights Went Down, they finally reached Kamelot. The Lords had heard of their arrival, and welcomed them into their splendorous castle. So much power did they emit with their presence, that our young witch and dwarf felt like they were in the very Center of the Universe. And indeed, although the army of dolls was frightful, they all Stood Their Ground against them; the sound of their leader Tommy and the shieldmaiden Alissa's voice alone sent shivers down her enemy's spines. The moon had risen high in the sky by the time the last golem was slain. Our heroes rejoiced and made a camp fire to gather round and rest. Their joy was short-lived, however, as yet another frightful roar shook the ground beneath their feet. 'But how? We still have such a long way to go before we reach the shore,' the dwarf pondered; he really was so tired of all this, and all he wanted was to return home and kick back his feet. Plot twists tend to be much more shocking if you don't warn readers about them with 'just then' or 'suddenly'. I read Stephen King's advice on how to write too, ya know. Just bear with me. A flash lit up the entire sky, prompting loud grunts and I'm-blinds from the party, and the Star Riders of Unisonic descended from the sky. And so the coupled thanked everyone for their much needed help, got on the star and shot out into the horizon - quite literally, too, for shooting stars are known for their speed. They had crossed the shore and the sea, and were now flying over the moon path, when the star began losing its light. Our friends, worried at first that the star was going out and would soon vanish, stared at it with gaping mouths. Far from going out, however, its tail of hot white fire had turned into one of pristine white scales, two of its hind beams had transformed into legs with frightening talons, and its front beams were now mighty wings, blowing gusts of wind with every flap. And then the final beam turned around and stared at them with a glowing yellow eye. And then every yellow and blue and red and pink star around them stared as well. Dragons! So many of them! The white dragon reached the Moon and entered within one of its craters, Within Temptation itself. After a series of enormous tunnels, the walls of which were occupied by hundreds of dragons, they landed inside a chamber with a ceiling taller than the sky back on Earth. And there she was - the Dragon Queen, looking at them with a welcoming smile. When she spoke, her voice was warmer than the sun's rays, yet melancholic, like the voice of Summertime Sadness. He's just going through his teenage rebellion stage. They wasted no time in getting back, and Sinéad did not even turn back into her star form. When they had nearly reached the shore, she turned back and shouted at them to hold their breath. The duo had little time to react before she dived headfirst into the cold waters. Using her wings as fins, she swam deeper and deeper, until she got to an underwater cave, and rose above inside, into an air bubble. And there, right in front of them, was the Hydra, still dozing (and snoring quite loudly, might I add). The witch and the dwarf snuck past its many heads to reach its belly, but just as they were about to strike, a thundering voice stopped them in their tracks. The Hydra spoke. The two shut their eyes and waited for the inevitable as, one by one the Hydra's heads awoke. And they heard Sinéad speak. A hundred and two heads, and double the eyes, turned to her with a look of bewilderment. However, only two heads were quick enough to turn back on time. By the time the Hydra had figured out that this was a distraction, the wand was buried into his belly. He let out a groan of pain, but none of its heads dropped. Instead, its body began multiplying and dividing over and over and over and in the end every head had its own body. This seemed even scarier to our heroes, who did not feel like fighting a hundred dragons at all, but the separation of their bodies had also split up the joint consciousness of the beast. And so, the Hydra was no more, and a hundred new shooting stars were born in its place. It was indeed a magnificent moment, yet neither the dwarf nor the witch felt like staying long enough to find out whether any of them still felt like breakfast, And They Ran instead. As they emerged from the waters once more, they heard a voice coming from the sky... and the sea, and the shore, and from within their own heads. "Well done," was the only thing it said and, although all of them looked at each other in confusion, they knew within their hearts that they had just heard the voice of Mother Earth herself. The dwarf was the first to break the long silence that followed. 'Do you think the Earth was actually in danger?' he asked, already aware of the answer. The other two nodded silently, and they turned their attention back on the long road ahead. Wow, much deep, such profound. 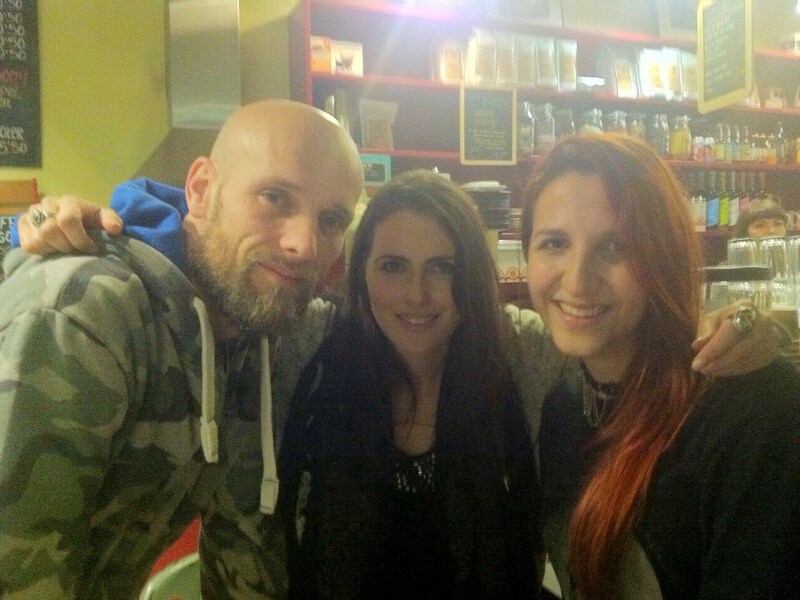 And a Happy Birthday to Sharon den Adel - the woman who gave my favourite band a voice. I have no way of knowing how different my life would be now if I hadn't heard of Within Temptation all those years ago, but somehow I think it wouldn't be nearly as good a it is now.